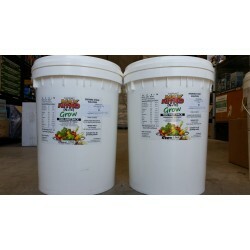 Aqua Fertik is a specially formulated, supplimental fertiliser for use in Aquaponic systems. It is t..
CANNA Aqua Flores CANNA Aqua Flores is a complete nutrient for plants, containing all the essential ..
CANNA Aqua Vega CANNA Aqua Vega is a fast working nutrient for plants containing all the essential e..
Certified Organic nutrient from Canna for use in potting mix and soil..
CANNA Coco A & B CANNA Coco A & B is a complete professional nutrient for growing plants in coco. It..
2 part powder nutrient. Makes 2 x 5L A+B concentratres which will then make 1000L at full strength. ..
2 part powder nutrient. Makes 2 x 110L A+B concentratres which will then make 50000L at full strengt..
2 part powder nutrient. Makes 2 x 110L A+B concentratres which will then make approx 50000L at full ..
Cyco Bloom A and B gives support to a plants natural growth by supplying a range of primary, seconda..